H. Ragheb, S. Velastin, P. Remagnino and T. Ellis, "ViHASi: Virtual Human Action Silhouette Data for the Performance Evaluation of Silhouette-Based Action Recognition Methods", the Workshop on Activity Monitoring by Multi-Camera Surveillance Systems, September 11, 2008, Stanford University, California, USA, to appear. We provide a large body of synthetic video data generated for the purpose of evaluating different algorithms on human action recognition which are based on silhouettes. The data consist of 20 action classes, 9 actors and up to 40 synchronized perspective camera views. It is well known that for the action recognition algorithms which are purely based on human body masks, where other image properties such as colour and intensity are not used, it is important to obtain accurate silhouette data from video frames. This problem is not usually considered as part of the action recognition, but as a lower level problem in the motion tracking and change detection. Hence for researchers working on the recognition side, access to reliable Virtual Human Action Silhouette (ViHASi) data seems to be both a necessity and a relief. The reason for this is that such data provide a way of comprehensive experimentation and evaluation of the methods under study, that might even lead to their improvements. We propose to utilize a virtual environment and produce valuable synthetic video data for the purpose of evaluating a class of action recognition methods. 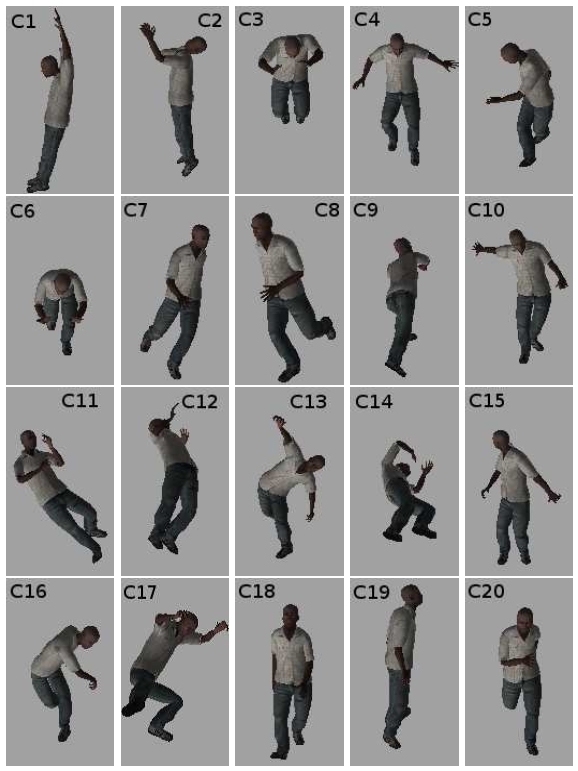 These are the silhouette-based human action recognition (SBHAR) methods. Such virtual action samples allow us to evaluate the strengths and weaknesses of any SBHAR method by performing a variety of quantitative experiments under controlled conditions. After describing the data in details, we briefly outline examples of experiments which might be considered not only to evaluate a SBHAR method on its own but also to compare it with alternatives. The virtual environment used here to produce the data is the MotionBuilder software. This software, which has mainly been developed for animation and film industry, provides useful tools and facilities towards producing synthetic videos. In this 3-dimensional (3D) environment, users can select or import characters (actors), skeletal motions (actions) and other elements needed in their scenarios to create their required story. Further, one can define unlimited number of camera views from which the videos can be rendered. The video frame rate and the video file format can be selected from a list of options. The start and end frame could be different from those corresponding to each of the whole motions used. We make the data available to the researchers in computer vision community through a password protected server at the Digital Imaging Research Centre of the Kingston University London. The data may be accessed by sending an Email (subjected "ViHASi Data") to Prof Sergio A. Velastin at sergio.velastin@ieee.org giving the names of the researchers who wish to use the data and their main purposes. The only requirement for using the ViHASi data is to refer to this site in the corresponding publications. We use the MotionBuilder software to generate videos of 20 different virtual actions (see Table1 and Fig. 3) performed by 9 different virtual actors (see Table2 and Fig. 1). These actions are captured at 30 fps with resolution 640x480 and using a variety of virtual cameras with up to 40 different viewing directions (see Table3 and Fig. 2). Each action class provides identical action motions and durations for all actors. These motion data correspond to the actions performed previously by human actors using optical or magnetic motion capture (mocap) hardware so that skeletal motions could be collected with reasonable precision. For each actor, we create 20 action sequences per camera using the mocap data that come with the software. The names and numbers (C1 to C20) of these action classes are listed in Table 1 together with the corresponding number of video frames. However anyone using our approach can use other mocap data, an important facility that we are planning to utilize in the future. We use some alternative 3D actors in addition to those provided by the software. These 3D actors, shown in Fig. 1, consist of very detailed 3D structures including skeleton, skin, cloth and face components giving realistic simulations of humans. Figure 1. 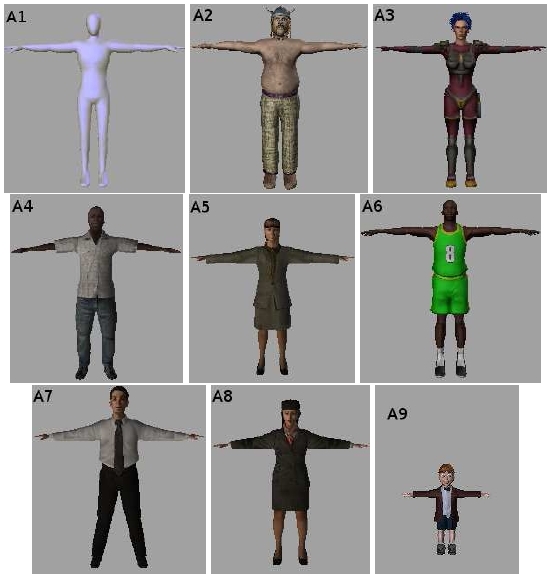 Images of the virtual actors to which the virtual motions are applied to generate virtual actions. As shown in Fig. 2, our 40 synchronized perspective cameras consist of two sets of 20 camera views. The cameras are located around two circles in a surround configuration where camera numbers are assigned in the anti-clockwise direction starting with V1 and V21. All cameras are directed towards an identical central point (called O in Fig. 2), i.e. the projection of the centre of the circles on the floor. All viewing directions in each camera set have an identical slant angle with the horizontal plane. The slant angle for the first set (cameras V1 to V20) is about 27 degrees while for the second set (cameras V21 to V40) the slant angle is 45 degrees. Neighbouring cameras in each set have a tilt angle of about 18 degrees with each other. The rotation angle of each camera around its optical centre is zero, so that an actor who is standing on the central point appears vertical from all camera views. The distances between cameras and the centre point O are set so that all of the actions are seen from all camera views for their whole durations. An identical distance is set for cameras V1 to V20 while another identical distance is set for cameras V21 to V40. We do not provide the calibration matrices for our cameras. However these cameras may be calibrated, if required, for instance using a silhouette-based calibration method. Figure 2. Camera configurations: top view of the first set of 20 cameras (left), and the second set of 20 cameras (middle); side view of sample cameras V1 from the first set and V31 from the second set (right). On the table below, you can click on the links to download the data for the corresponding action, or you can click here (150 MB) to download the complete set. We are planning to provide the 2D ground-truth images of joint positions (2D pose data) corresponding to the silhouettes (to appear here as soon as completed). Table 1. Action class names as appearing in the ViHASi data folders and corresponding numbers for the 20 virtual motions which are applied to the 9 virtual actors of Fig. 1; the number of video frames (at 30 fps) for each class is also given. It is straightforward in MotionBuilder to extract the silhouettes corresponding to the bodies of actors at each frame, an advantage of virtual world that is hardly possible in real world. Having extracted accurate silhouettes of so many action samples, one can evaluate the performance of SBHAR methods in a more controlled manner. We plan to complete generating the remaining branches of the data and extending its coverage. So far, we have generated videos by applying the 20 classes of action mocap data a) to 2 actors (A1 and A2) and capturing from all 40 camera views (V1 to V40), b) to another 4 actors (A3, A4, A5, A9) and capturing from 12 camera views from the first camera set (V1, V3, V4, V6, V8, V9, V11, V13, V14, V16, V18, V19), and c) to another 3 actors (A6, A7, A8) and capturing from 12 camera views from the second camera set (V21, V23, V24, V26, V28, V29, V31, V33, V34, V36, V38, V39). Note that actor A1 is a humanoid suitable to be used as the main actor in the training data. Also, our actors provide both male and female body shapes together with a variety of clothes. Further the most recent actor we have added is a kid (A9) that might provide more challenging motion patterns compared to the adult actors. Fig. 3 shows sample images taken from each of the 20 action classes listed in Table 1 and performed by the actor A4. Finally, Tables 2 and 3 provide the corresponding names as appear in the ViHASi data folders together with the symbols used here to refer to them. Figure 3. Sample video frames (using the actor A4 and camera V1) taken from each of the 20 action classes (C1, C2, ..., C20) as per Table 1. Table 2. Actor full names as appear in the ViHASi data folders and the corresponding symbols used in Fig. 1. Table 3. Camera full names as appear in the ViHASi data folders and the corresponding symbols used in Fig. 2. For all experiments performed using synthetic data, the number of action classes should be set to the maximum, i.e. 20, while the number of training cameras and actors may vary in different cases. Different experiments may be designed to evaluate specific behaviour of the SBHAR method under study depending on the samples included in the training data and the ones included in the test data. These experiments include but are not limited to: a) Leave-One-Out Cross Validation; b) Identical Train and Test Actors with Novel Test Cameras; c) Identical Train and Test Cameras with Novel Test Actors; and d) Novel Test Actors with Novel Test Cameras. For each experiment the results should contain: the overall recognition rate; the total number of misclassifications out of the total number of test video samples; a table for the number of misclassifications per action class out of the number of test samples belonging to that class; a table for the number of misclassifications per actor out of the number of test samples belonging to that actor; a table for the number of misclassifications per camera out of the number of test samples belonging to that camera. Similar experiments may be repeated for the test videos: a) corrupted by noise, for instance by adding salt-and-pepper noise with a variety of noise densities; and b) corrupted by partial occlusions, such as vertical and horizontal bars or similar measurable occlusions. Sample original and corrupted silhouettes are shown in Fig. 4 for two different camera views and the same frame. Finally, an experiment to test the capability of temporal segmentation algorithms in conjunction with a SBHAR method, is to concatenate all action videos corresponding to a single camera and a single actor, and test this long sequence (where training data do not include any of these test samples). Although here there is no natural transitions between different action classes, this is still a challenging experiment that is worth trying. Figure 4. Sample silhouettes of the action class KnockoutSpin (C11) captured using two camera views V1 and V6 (left) and the corresponding corrupted images by adding 40% salt-and-pepper random noise (middle) and partial occlusions, using 6 and 8 pixels vertical and horizontal bars, to fragment silhouettes (right).